Welcome to Speechless in Europe! We believe that there are other ways of talking politics than just using words. Between October 2015 and March 2016, we want to see, hear, and watch your stories and get to know what you have to say about Europe. Tell us your story in video, graffiti, theater, photo stories – you choose the format! Please remember: your videos should be no longer than 2 Minutes maximum and your pictures not bigger than 1000x yy pixels. Starting in October 2015, multiplier workshops will take place in Paris, Rome, Budapest and Berlin. 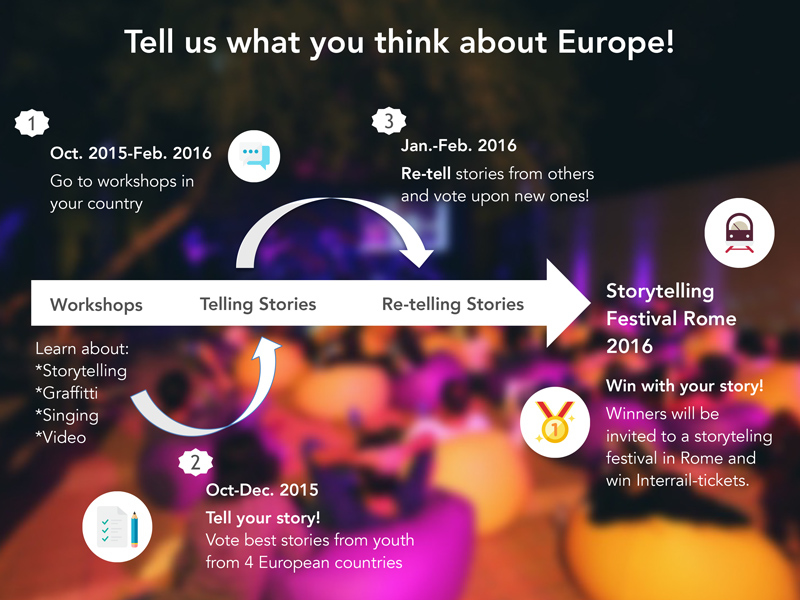 In the workshops, young people from France, Hungary, Italy and Germany are invited to develop and share a story on Europe. They will create their story in groups, and subsequently upload and present it here on Ypart. How can I post a video proposal? After uploading, the stories from the participants will be discussed and voted upon. Each participant is invited to vote for the best contribution in one of our 5 categories. Then, the local teams will choose a story from another country to “re-tell” – in their own style. At the end of the project, 10 finalists of each country will be hosted in Rome, where the Storytelling Festival will take place. The Participation to the Festival will be free and open to any young people interested over the age of 18. The festival takes place in May 2016. Find out more on www.speechlessineurope.org! Want to find out more about using Ypart? Check our our videotutorials! If you have any questions, please contact our Speechless in Europe-partner Eva Panek will be glad to help. eva.panek[at]liqd.de. AngelK France bearbeitete den Vorschlag What about this Europe ? Budapest_retelling Hungary bearbeitete den Vorschlag Why walls? !